Leather is an elegant and robust furniture material. Being a natural material it needs some basic knowledge to keep it in a good condition. 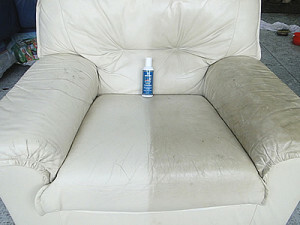 A demonstration of the effects of Colourlock Leather Cleaner on a soiled leather chair. Later Colourlock Leather Shield Protector was applied. Always apply Colourlock Leather Shield Protector directly after cleaning. Apply directly onto a lint free cloth and wipe over the leather surfaces, mainly concentrating on the seat tops, pipeing, arms and headrest areas on furniture. In cars the front seats and entry areas/bolster panels require the most attention (high contact areas). This will protect against dye transfer and friction damage. If you have just purchased white or light coloured leather, apply Colourlock Leather Shield Protector as soon as possible and then on on a monthly basis, especially on high wear areas, to protect against soiling and dye transfer. For darker coloured leather use Colourlock Leather Shield Protector every three months, to prevent premature wear and discolouration. Colourlock Leather Shield Protector has a permeable membrane that allows the leather to breathe – allowing air, water vapour and conditioning oils to penetrate. Colourlock Leather Shield Protector places a nano- barrier on the leather surface, minimising dirt, soiling and dyes from transfering to the leather. This makes it easier to clean and gives a smooth silky feel. If used regularly, this unique revolutionary product will significantly extend the life of your leather. If Colourlock Leather Shield Protector has been applied, wait 24 hours before applying the Colourlock Fadegard Leather Conditioner. The protector has been designed to allow the conditioner to penetrate through the permeable barrier leaving the protective coating in place. Apply Colourlock Fadegard Leather Conditioner directly onto a lint free cloth and wipe over the leather surfaces using a circular motion. This product moisturizes, nourishes and feeds the leather, while protecting against harmful UV rays. Condition leather regularly (every three months) using Colourlock Fadegard Leather Conditioner, (more often, if the leather furniture is exposed to high levels of sunlight). Note. With any care products, always test on an unseen area before use. All leathers are different – different hides, different tanners, different countries. A safe rule is: LESS IS BETTER THAN MORE. Fact 1: The clear protective top coat must be protected from jeans studs, pockets and zips. They cause FRICTION DAMAGE to edges, seams and seats. Oils and fats (from the head and hands) often plasticise the protective coating and INCREASE friction damage. Fact 2: The top coat must be protected from clothing dyes which can transfer (especially when damp) to the leather, resulting in permanent damage that only a professional can remove. In testing it was found oils and fats INCREASED dye penetration. Fact 3: Leather should be conditioned on a minimum of three or four times a year to keep it soft and to prevent shrinkage and cracking.